I transfer data between a disk backup set and a tape backup set as final destination and somehow the total amount of data on the tape backup set is not eaqual to the source backups set. There are more than 100GB data missing. I couldn't find any setting in the backup script who explains this difference like deplucation. What is going on? we have now recovered a volume to determine if any data will reappear after recovery but some data is actually missing. 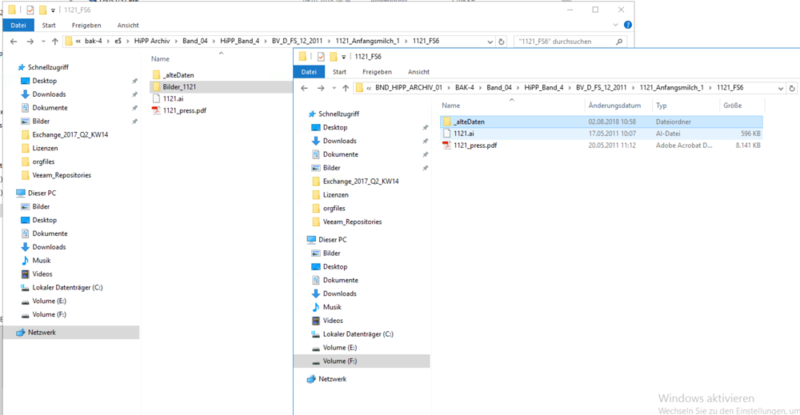 As shown in the screenshot below, the entire folder Bilder_1121' is missing in the recovered volume. And this continous through the entire backup. This is frightening and a really serious problem. First, I hate to sound like a broken phonograph record, but what numeric version of Retrospect Windows are you running, and what version of Windows and/or Linux are your "backup server" and "clients" running? Second, how are you doing "transfer data﻿ between a disk backup set and a tape backup set"? Is it with a series of Transfer Snapshots script runs (pp. 210-217 of the Retrospect Windows 15 UG), or is it with a Transfer Backup Sets script run (pp. 206-210)? If it is with a series of Transfer Snapshots script runs, is there something special about when "the entire folder Bilder_1121'" should have been transferred? Or whether, with either type of Transfer, you have a a Selector that would have prevented the transfer? Please remember, in posting examples, that most people on these Forums don't understand German—so include some English interpretation. we are using Version 12.6.1 for Windows, the Client Version is 12.5.0, both on Windows Server 2008 R2. 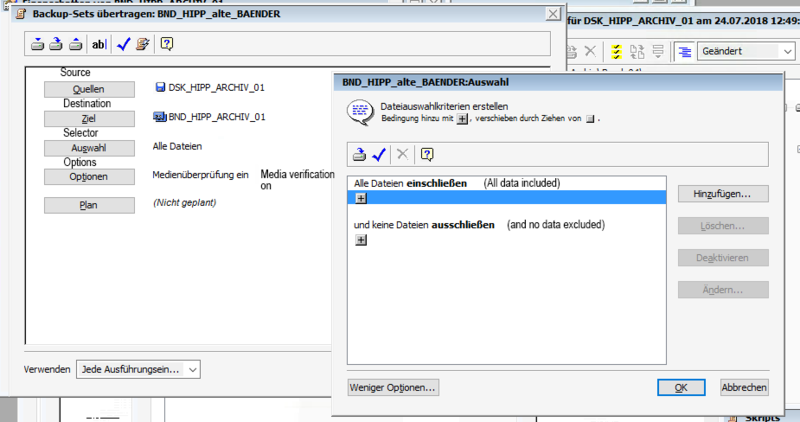 For transfer the backup set from disk to tape I configured a Transfer-Backup-Set script, select one disk backup set as source and antother tape backup set as destination and left the script options in default settings. This means that in the script options are 'all files' selected and in the 'Advanced Option' tab are 'all files included' and 'no exclusions' configured. The script was eexecuted as a recycling script and the target tape backup set was created new. I found a thread in the recent-versions Retrospect Mac forum, ending with this post by a Retrospect Inc. employee. Copy Media Set is the Retrospect Mac equivalent of Transfer Backup Sets (this table had the terminology for the Retrospect Mac equivalents of Transfer Snapshots and Transfer Backup Sets reversed; I've just fixed it). Based on that post and preceding posts in its thread, if you are using the Recycle source Backup Set after successful transfer option (described most fully on page 372 of the Retrospect Windows 12 User's Guide) it might be a good idea to stop using it. Here's why and how to file a Support Case; Retrospect Tech Support almost certainly has someone who knows the German-language version.